Being the foremost disciple of Pt. Ravi Shankar, Vishwa Mohan belongs to that elite body of musicians which traces its origin to the Moughal emperor Akbar's court musician TANSEN and his guru the Hindu Mystic Swami Haridas.Vishwa Mohan Bhatt has attracted international attention by his successful indianisation of the western Hawaiian guitar with his perfect assimilation of sitar, sarod & veena techniques, by giving it a evolutionary design & shape and by adding 14 more strings helping him to establish the instrument MOHAN VEENA to unbelievable heights. With blinding speed and faultless legato, Bhatt is undoubtedly one of the most expressive, versatile and greatest slide player s in the world. Being a powerhouse performer, Vishwa's electrifying performance always.captivates the audience whether in the United States of America, Europe, Gulf countries or his motherland India. 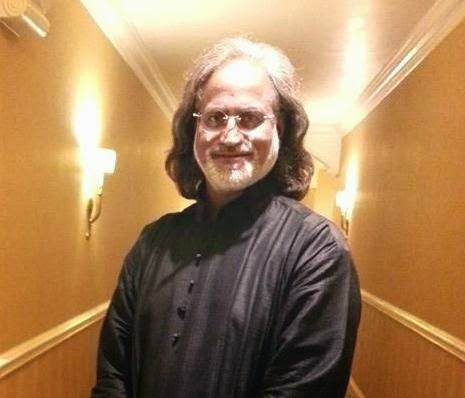 Vishwa Mohan has become the cultural ambassador of India by carrying the Herculean task of glorifying and popularizing Indian culture and music throughout the world.Outstanding features of Bhatt's baaj (style) are his natural ability to play the 'Tantrakari Ang' and incorporate the 'Gayaki Ang' on Mohan Veena which is the greatest advantage of this instrument over traditional Indian instrument like sitar, sarod and veena. It was no surprise that Vishwa Mohan with his sheer virtuosity and limitless supply of melodies won the highest music award of the world, the GRAMMY AWARD IN 1994 along with Ry Cooder for their World Music Album, 'A MEETING BY THE RIVER' enhancing his celebrity status not only as a star performer but also as an improviser and a soulful composer.Vishwa Mohan has performed extensively in the USA, USSR, Canada, the Great Britain, Germany, Spain, France, Italy, Netherlands, Belgium, Scotland, Switzerland, Denmark, then scaling the Gulf of Dubai, Al-Sharjah, Bahrain, Muscat, Abu Dhabi etc. and throughout India.